I was born in Norway in 1939, at 63 degrees north in the dead of winter. The small town of Kristiansund N., where I grew up, was practically destroyed during the Second World War. I am the oldest of six siblings, three brothers and two sisters, and in 1959 I emigrated to the United States by myself, looking for economic opportunities that were not available in Norway at that time. I met my husband in Los Angeles when he was an undergraduate student at UCLA. We got married in 1961 on the beach in Malibu off the Pacific Coast Highway and we are still married 56 years later. It was a “start up” marriage; we were young and we owned nothing. I attribute longevity in our marriage to mutual respect for individual freedom to live a life of self expression and adventure. 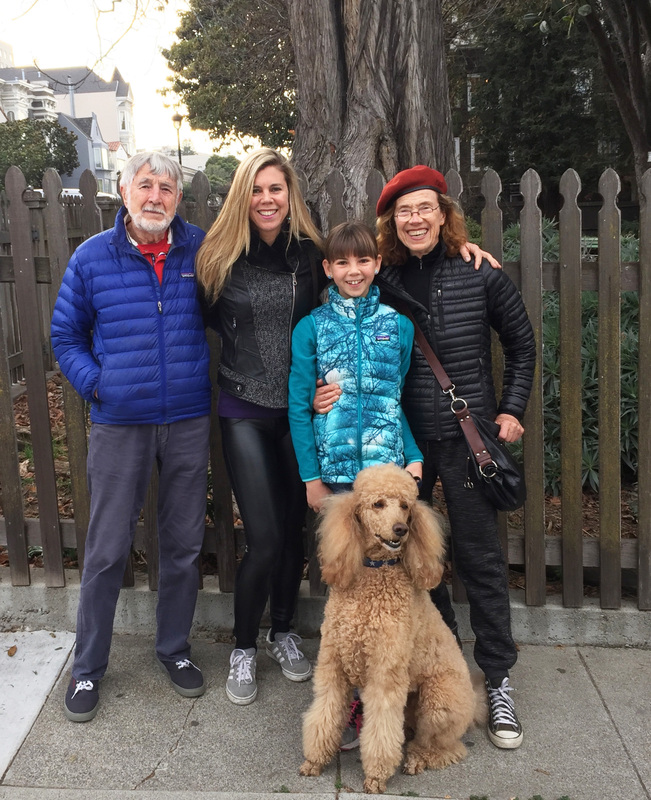 I currently live by the ocean in Santa Cruz, California with my husband Joe and my Standard Poodle, Balder. Our daughter Tanya and granddaughter Simone live close by. Our whole family enjoy exploring the beauty of nature and the physical challenge of ocean and mountain activities including surfing, swimming, skiing and climbing. I started technical climbing at the age of 64, a couple of years after my retirement from the City of Santa Clara, in Silicon Valley, where I was the Director of Finance for the City and the Public Utilities. In the spring of 2003, I traveled to Cuba. The expedition I joined had permission from the U.S. State Department to visit certain land preserves and tobacco farms for environmental research. While in Cuba, I met several local and American climbers. This experience was a catalyst for my interest in technical climbing. Upon my return to California, I was fortunate to be referred to a world class mountain alpinist and guide living in Santa Cruz. I climbed a substantial number of ice and rock routes with him in various location in the U.S., France and Norway over a 13 years period through the spring of 2015. Since the fall of 2015 I have been ice climbing with the Chicks (Chicks Climbing and Skiing), in Colorado, Wyoming and Iceland. In March 2017 I traveled to Scotland with the intent to ice climb various routes on Ben Nevis (4409 feet from sea level) with two very competent climbers, one of them an internationally certified guide. We did summit the Ben via the trekking route. However, technical ice climbing was not possible due to weather including 40 to 50 miles an hour winds, rain, snow, spin drifts and avalanche danger in the climbing gullies and ridges. My current initiative is the 8 for 80 Project. For this project I will be climbing with friends and various guides depending on the location. The 8 for 80 Project was designed to accomplish three things that I am passionate about: Raising $100,000 for Parkinson’s and Alzheimer’s disease research; celebrating life by climbing 8 major ice and rock routes in different mountain ranges around the world by the end of winter 2019, when I will be 80; and sharing about the 8 for 80 project to inspire people at any age, to take action for their own lives and be a stand for their own physical and mental well being.